Welcome to Day 21 of my #100DaysofBulletJournalIdeas Project! This may or may not seem like an obvious idea, but once you start Bullet Journaling, especially when you're looking around online, you may find that you start growing an increased interest in acquiring new things. This may make your wallet weep, it may not. Depends. The question is: do you buy all the things right then and there? Or do you write them down to revist later if you're still interested? I'd understand if you clicked the buy button or made that impulse purchase at the store. I've been there. 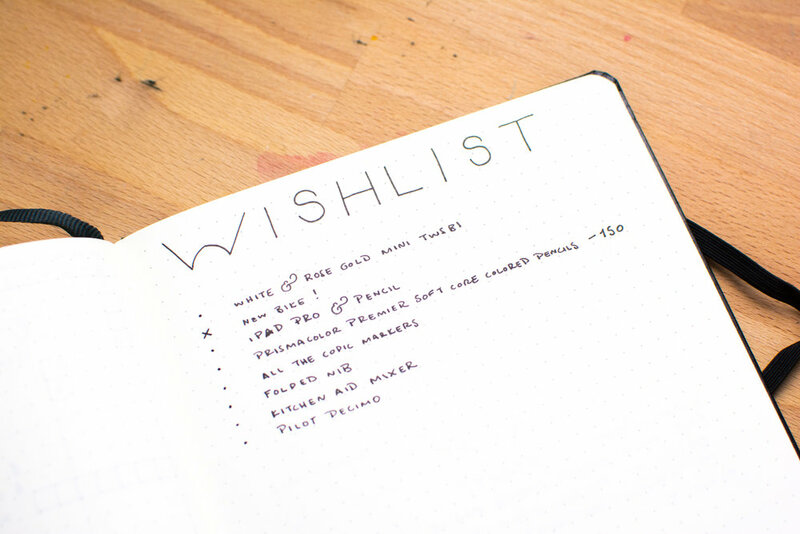 I like to keep a wishlist for all sorts of things I may want to grab sometime in the future. They don't always have to be big ticket items, they can be simple little things that I may want to grab. By writing them down, I can curb that appetite to buy all the things by taking some form of action. That way I still get that satisfaction of having done something about said item, but without having actually spent any money. This way my bank account tends to be happier and I can rest easy knowing that my coveted items are safe in a list in my Bullet Journal. Sometimes it also helps you figure out whether you truly want the thing or if you just feel like it'd be nice to have but you probably wouldn't use it all that much. You can add columns to add details like the cost of the item, for those of us who are budget-conscious, or draw out the things you want - it's up to you.